Relocation to an Open Office: What is the Best Layout? So you have decided to relocate and you know you want an open-plan office, but which layout will you use? The layout of an office is very important and can have a direct impact on how well your employees work so it is important to get it right. Read this article to learn about the four types of open office plans and find out which one is the best fit for your business and your employees. 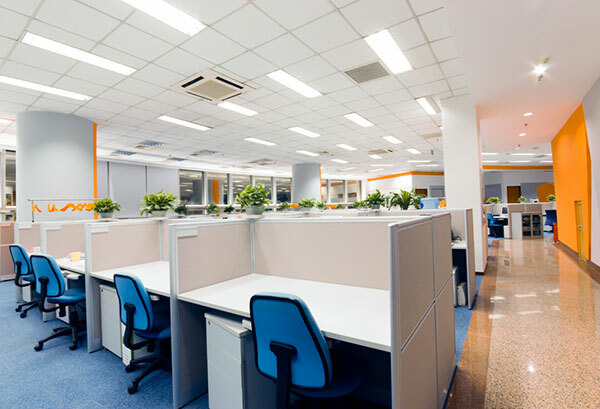 Relocating your business is the perfect time to reassess the functionality of your office and with a clean slate you can create the perfect working space. Gone are the days of employees working alone in a single room. Open offices now dominate and can create a sense of unity and encourage an open door policy. However, businesses come in different shapes and sizes and one size does not fit all. Positives: Provides the most privacy for the employee, with three walls noise levels can be kept down and will provide good working conditions for maximising concentration. Negatives: Can feel claustrophobic and may decrease natural light to the workspace. How: Workspaces are divided by three or just one, shorter partition which can be seen over when standing. Positives: Allows more communication and more natural light to workspace. Negative: There will be more noise which can effect concentration levels, and less privacy. How: Put employees of the same team in one office/group of cubicles. Positives: Great if your business has different teams, grouping them in the same office will encourage communication without it affecting people of other teams. Negatives: Noise and privacy issues, and decrease in communication between different teams which may restrict the business. How: No partitioning or separate cubicles, open desks. Positives: Usually in desk rental offices. Good for smaller business or freelancers who want to be in a shared environment. Negatives: Noise and privacy issues. Hopefully this article has given you some help on deciding how to layout your new office space. Now you have an idea of the layout you can start planning how you will make the all important move. Relocating your office can be a stressful and challenging time and near impossible to embark upon alone. That is why it is import to enlist the help of a moving company to ease this transition. Business Relocations are specialists in ensuring technology is transported safely and remains in its original condition using an extensive array of specialist equipment like pre-moulded bags to fit common computer shapes and sizes, specialist computer trollies and static resistance materials. As always, feel free to get in touch with our office moving specialists for more insights and advice on how to approach your next office, commercial or business move. With branches in Auckland, Wellington, Christchurch and Hamilton, we’re proud to be New Zealand’s best commercial and office moving team.